I live in an area that's commonly referred to as "Two Hours From Anywhere". We're approximately two hours from Chattanooga, Atlanta, and Asheville. Far enough away from all of the hustle and bustle but close enough if you were to need to see a specialist or be in need of an airport. We frequently visit Tennessee and Georgia and can make it to each state line in around 30-40 minutes. Last weekend we decided to head toward Cleveland, TN which usually takes us about an hour. We pass this barn each time we go. I've always admired the "See Rock City" barns but took for granted that not everyone grows up getting to see advertisements painted on their local barn roofs. I knew a little bit of the history behind them but decided to do a little more digging so I could share it with y'all! 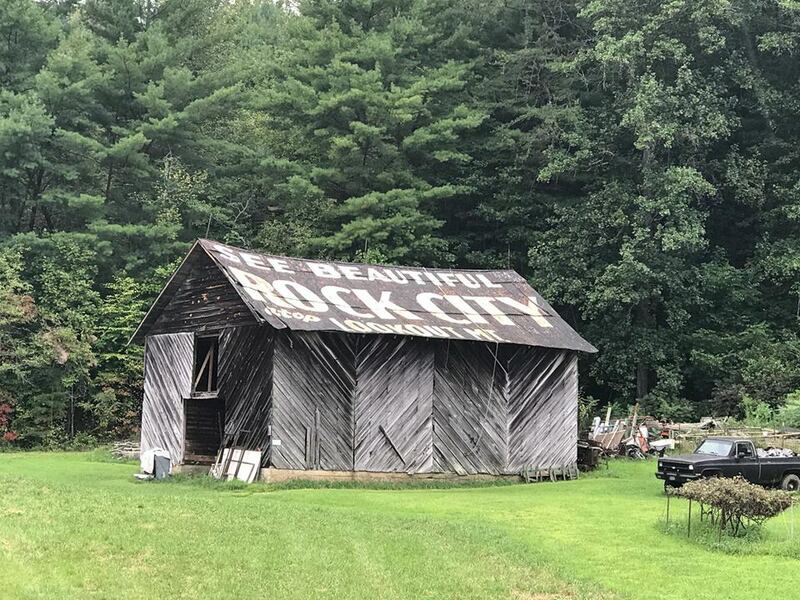 According to the Rock City website, "Since 1935, Rock City barns have stood as genuine highway Americana, their bold white-on-black signs compelling both snowbirds and Sunday drivers to a spot near Chattanooga, Tennesseee, where they could "See Rock City." A man named Clark Byers painted the barns for three decades, from 1935 until his retirement in 1969. Over his career, he painted around 900 barns in 19 states. As compensation for the barn owner allowing the use of their barns for advertisements, they would receive free passes to the attraction and an armload of promotional merchandise. The barn owners who didn't need tickets or memorabilia were paid a whopping $3. During Lyndon Johnson's presidency (1963-69), billboard-banning legislation known as the "Ladybird Act" was passed. This meant that many of the of the Rock City messages had to be painted over. After a near electrocution during a thunderstorm while doing a painting "cover-up", Byers decided to retire. Barns are still being painted today. Tennessee has the most Rock City barns and they have all been named historic landmarks. I wish that every state would do this. Click here if you'd like to see a map of where all of these famous barns are located. Of all the years that I've called western NC home and have driven past some of these barns, I have never made it to Lookout Mountain to actually SEE Rock City. I'm hoping to change that soon. Good Lord willing and the creek don't rise! Do you happen to have any Rock City barns where you live?